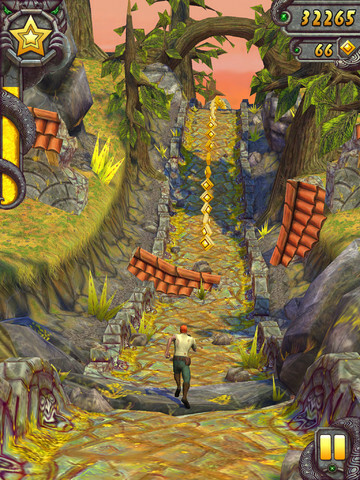 The original temple run was met with much love and addiction to many people. An easy to learn, hard to master, game that keeps you engaged and interested. The sequel certainly carries along the line of the “if it isn’t broken, don’t fix it” ideology. You are an adventurer in a temple and you must run for your life. A large ape like creature is chasing after you, and if you are not quick enough it will capture and kill you. The graphics in this game are very sharp and beautiful to look at. It may be difficult to really appreciate because if you take a moment to admire the view, you will die. There is never any lagging in the game despite having landscape come past you at a faster and faster rate. Your path as you run for your life is randomly generated as you increase the speed you go past it. Sometimes you must jump over a gap, slide under fire, or zip down a rope, all of which are clearly and beautifully rendered for an iOS game. There is also a section where you must ride a cart through a cavern, which is also wonderfully rendered with crisp textures. Your character, one of many to choose from, has a model that is nothing fancy but the textures on it are shaded and detailed. Collecting the game’s currency and upgrades feel more satisfying when you could hear the auditory confirmation that you got it. Sometimes the games moves too fast for you to know if you got a Gem or other treasure, so the sound is important in order to know where you stand. The back ground music is fast paces with a drum beat that makes you mentally feel like you are in a rush. And the coin collection sound goes well with it, as it is a beat sound rather than the usual money chinking sound. Collecting money sounds more like it is part of the atmosphere and background music rather than grabbing coins, which is a good thing. The game starts you off at a slow pace, letting you enough time to think about your actions as you near obstacles. There are things you must jump over like broken bridges, large stones, and turning wheels with spikes on them. Then there are things you must slide underneath like fallen logs and fire. Another obstacle is old brick walls or part of the path missing that you must move to the side of as you run. If you are lucky, you will lead yourself to a cavern where you must ride a cart through broken tracks. If you find yourself being slowed down by hitting an obstacle, the ape creature chasing you will catch up and eat you. A terrifying and yet thrilling moment in the game that keeps you on your toes. The controls are tight and responsive. For jumping swipe your finger up, to slide swipe your finger down, to turn swipe your finger left or right, and to move from one side of the path to another tilt the iOS device. To direct the cart in the cave section, you just have to tilt your iOS device side to side. All these inputs can be overwhelming at first but they soon become second nature. 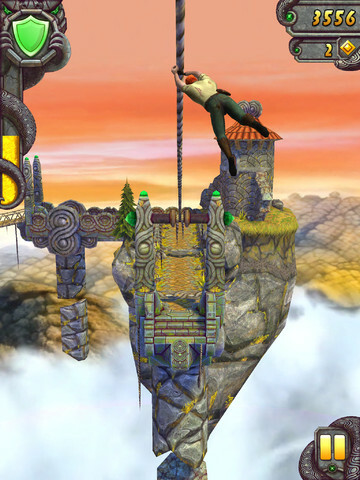 As you get more used to the controls and make it further on the paths, the game speeds up to keep things challenging. Soon you will find yourself trying to keep up with the game as two different obstacles seem to be in the same spot and you have to think fast in order to combine two inputs to get past it. When you die, you can either use a gem to revive yourself or simply start again from the beginning. You can either collect gems through the game, or buy them with real money. Not purchasing the gems and simply using the ones you find is more than adequate, there is no need to purchase them unless you want to. You can also collect currency in the game to unlock new characters and upgrades. You can buy the in game currency with real money as well, but it is not necessary to enjoy the game either. 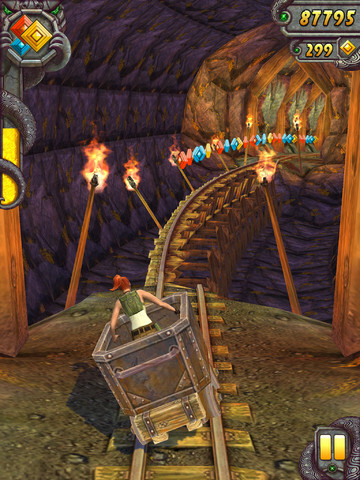 Temple Run 2 is a solid sequel to Temple Run. The game play is fun and addicting, and the visuals are great. This game is free and you do nothing but gain some fun time with it if you get it. You don’t lose anything from the fun of the game if you do not buy the game’s currency with real money, which is a huge plus in a world of pay to win games, which this game is not a part of. This game is definitely worth a try with it being free, fun, and great to look at.